In a Dutch oven heat butter with oil and sugar until the butter and sugar have melted. Add the onions and cook over moderately low heat for 15-20 minutes, stirring to brown them evenly. When onions have turned soft and golden brown, gradually stir in beef stock. Bring to a boil; lower heat and simmer gently, covered, for 1 hour. Toast rounds of French bread. When soup is cooked, stir in the brandy and the Dijon mustard, and taste for seasoning, adding salt or freshly ground black pepper if necessary. Place ovenproof soup bowls or crocks on a baking sheet with sides. Ladle the hot soup into the bowls and top each serving with 1-2 slices of toasted French bread (or croutons). Lay 1-3 thin slices of Swiss cheese on top of the bread. Under broiler, melt cheese until golden brown and bubbly. Kathy, I loved the crying computer in this video! Thanks a lot for this video, I’ve always loved French Onion Soup and ordered it every chance I could. Now, I can make some myself! I’m so excited! I’m so glad I found you on YouTube! Thank you Kathy, made the onion soup very good, and so filling. Paul, I don’t know if you noticed but this recipe is a very old recipe adapted from: The Robert Carrier Cookery Course (1974)! Thanks for the recipe. 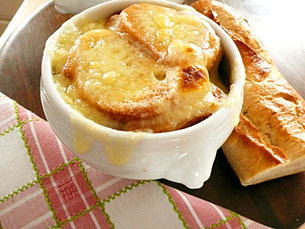 I love onion soup and this is much easier than other recipes I have seen. Some say onions will make you cry … but this is really a small price to pay for a delicious French onion soup. Enjoy!